It’s time again for the annual Fleur Delicious Weekend in Eureka Springs! This french-themed weekend is a celebration of all of the senses, sight, hearing, smell, taste and touch! Here are a few of this years events to get you in the mood! at The Crescent Hotel. 9:30pm. 75 Prospect Ave.
Eureka Springs Farmers Market. 7am to Noon. 2075 E. Van Buren. July 11 and 12 – DeVito’s of Eureka Springs will offer FDW menu specials. DeVito’s of Eureka Springs. 5pm to 10pm. 5 Center St.
July 11 and 12 – The Grand Taverne prepares FDW menu specials and wine pairings. The Grand Tavern. 5pm to 9pm. 37 N Main St.
To learn more about Fleur Delicious and discover other events on the Official Eureka Springs Calendar of Events or fleurdeliciousweekend.com. 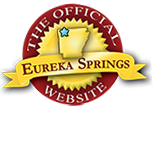 This entry was posted on July 8, 2014 by service424 in Arts & Culture, Crescent Hotel, Culinary Adventures, Festivals, Fun Downtown, Things to Do and tagged Crescent Hotel, Devitos of eureka springs, fleur delcious, food, menu, senses, the grand tavern.